I read this article and found it very interesting, thought it might be something for you. The article is called June 2015 – Monthly Income Report and is located at http://www.onehourprofessor.com/june-2015-monthly-income-report/. 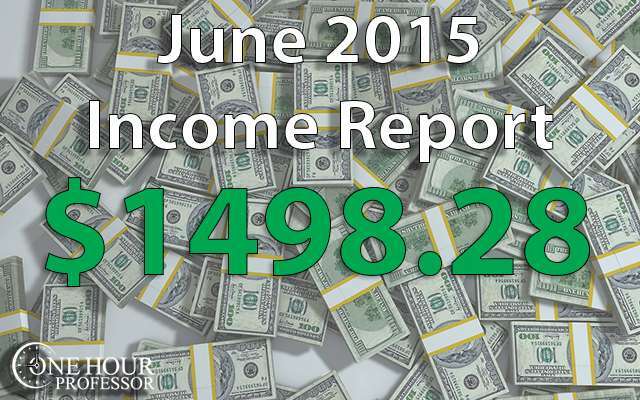 Hello all and thank you for checking out my June 2015 income report. While tallying everything up this month, I’d be hard-pressed to say that a smile didn’t come across my face. For those who have been following the blog a while, you’ll know that since 2015 started I had put together four consecutive months of profit for my online business, but last month changed that because of a lack of consulting work. Obviously this month is different as I’m reporting my highest earnings yet for the blog. If you want to always see these income reports when they come out (and get some other cool stuff) make sure to sign-up for my email list. Nearly all of my extra time was spent working on my authority website experiment this month. As I mentioned previously, after being featured on the 1-day business breakthrough podcast I wanted to become laser focused on creating a profitable Authority website and I’m glad that I’ve been able to stick to that. Running through my time worked report, you’ll see that all of my posts were concentrated on the authority website experiment. I was able to create a blog post specifically covering how to choose a website domain name. Many people struggle with this part of their website because they are scared of choosing the wrong thing. This post goes on to explain the differences between keyword rich domain names and unique branded domain names. If you’ve ever struggled in creating your own domain name, I’m confident in saying that this post will help you the next time that you try to complete the task. In addition to that, I wrote how to complete competitive analysis before you Spend Your Time Creating an Authority Website. This is something that people often don’t spend enough time on and it is definitely the biggest mistake that you can make. If you don’t spend enough time researching your competitors, you might create a website and come to find out that you never really had a chance of ranking in the first place. Don’t just do keyword research, you also have to do some website competitive research. Speaking of keyword research, my most popular blog post this month focused on that exact topic. The details my exact process of keyword research and the tools that I recommend you use (both free and paid) to do this too. Aside from my blog posts, I spent the usual hour each month uploading my bulk CSV file to HootSuite. It’s really nice to know that every single day of the month I have five Twitter posts going out and I only spent an hour doing the work. For those that are interested in how I did this, check out this blog post and make sure to join my email list if you want the template. As always, I spent just under three hours creating my income report for May which was pretty depressing. Lastly, and probably the most important thing that I’ve been working on this month is the authority website experiment. I’m not going to go into details of exactly what information I’m providing, but all this time was spent between myself and my contractors creating databases of information that aren’t available anywhere else and are very localized. I haven’t completed everything yet in terms of databases on that website, but I’m happy to report that I’m getting very close. Boo yeah, baby. I’m by no means gloating, but I was really excited to see how much income I actually made this month. Last month was a big dip and truthfully it hurt to put that income report together. But that’s okay, because this month was my best ever and I feel was well-deserved. Although the majority of my income this month was from my consulting, there was also some genuinely passive income streams that showed up and are exciting to see. 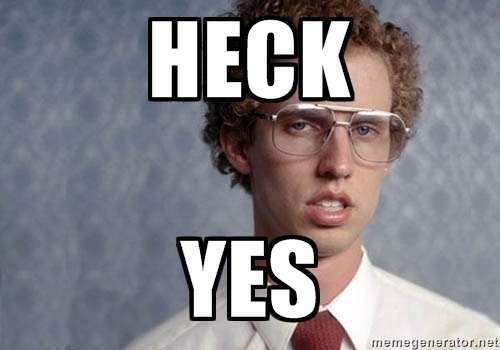 The first place where I made income this month is through Google AdSense. This is primarily through my 90% outsourced website experiment which still continues to bring in a few bucks a month. It’s interesting though because last month I had a big jump in AdSense revenue, but this month the numbers fell again. LegalMatch, which is a service that finds lawyers for individuals who need them, contributed five dollars this month. My YouTube Channel brought in $14.39 this month due to the ads that are shown on my videos. I’m actually really surprised about how much money is coming in through this channel and find it interesting that I’m making so much from so little work. This month I was able to bring in another $15 from my new Udemy course. Out of curiosity, I took my course that I offer here for free that has over 3500 students and 17 five-star reviews, and priced it at $100 on Udemy. Granted, people can get this course absolutely free by signing up for my email list, but I’m really curious to see how many people that don’t know my website may make a purchase. This will be an interesting experiment in July. After driving thousands of clicks to Bluehost, I finally got my first affiliate sale. I’m not sure exactly where the person came from, but I was just happy to see that someone finally used my link. Plus, this deafly is a nice commission at $65 per sign up. My consulting work really came through big-time this month and accounted for $2025.00. I knew that this was coming because I was nearing the end of a big project and one of my clients had a payment due. At this point in time, I don’t believe that my consulting income will continue to be this large, but we’ll see what happens in the future as I could pick up a client at any time or expand on what I’m doing for my current clients. As always, I made a few extra bucks from Aweber because someone out there continues to use them as their email provider. Expenses this month were similar to what they were the previous month and most of this is due to the authority website experiment. Next, I had an expense for a website called createaclickablemap.com. All that this is a clickable map that I wanted to use on my authority website and the cost me just under $10 to get the map so that I can embed it on my own website. This is going to be my last month of being signed up for SEMRush. Although they service is very valuable, I found that after having it for about four months and doing all the research that I needed, I didn’t need any more. I still need to do some type of tutorial for this, but it just hasn’t been on my radar with the authority website. I’ll probably sign up again in the future and show you what it’s capable of, but for now you just have to trust my word that it’s pretty amazing. The last expense for this month was because of Elance.com. The total amount was just over $500 and all of this money was spent on the authority website. A lot of it to customize the theme, but the majority of it was spent on a freelancer to create various databases of information that aren’t available anywhere else. I’m confident that these databases will drive a ton of traffic to my website, but for now I’m just going to have to eat the costs. I came really close to getting this done this month, but I wasn’t able to complete it because my programmers are having some issues and there’s more work than I had anticipated. I have the main navigation built out for my authority website, as well as one of my databases, but I need to complete another database of information and finish my opt in guide. This is going to be a guide and although I would love to say that I worked on it a lot this month, I spent the majority of my time making sure that the databases were correct. I’m trying really hard to make a good lead magnet that doesn’t take up all of my time to create. In terms of getting profitable again, I definitely did that this month. Even though this is taking longer than I thought, I’m really confident that I can get this done in July and want to make sure that I get everything launched. Just like above, this is going to be a difficult goal to complete but I think that in July I’ll be able to do it. I’ve been thinking about this and have been trying to wrap my head around this for some time, and I think I have everything in my mind but I just don’t have it on paper yet. I’ve cut a few of my ongoing costs every month and I’m really hopeful that I can stay profitable this month. I know it’s going to be a close one and although I can expect around $500 in consulting income to come in, there is still a lot of things to have my freelancers work on. That’s it for June, it’s been a good one. For those of you who have your own online businesses, how did June go for you? I figured last month was a fluke. You are doing great man. I love reading your income reports. Its very inspiring. Since you track it each month I’ve added you to The Ultimate List of Blogger Income Reports. Thanks so much. Cant wait to what next month looks like! Amazing and really impressed with your online income report list and it has inspired me to work harder. I’m a blogger from Malaysia and currently generating online revenue about $200 per month from http://www.myhighlyrecommended.com blog. I really admire to be successful and listed on your Blogger income report. Nice layout, keep up the good work! Hey Ron, good to see the income starting to come in. It’s a slow process, but you will get there my friend. Hey Richard, thanks bud. I appreciate that. June was a good month for sure, the month before that was a farce I think. But thanks again, how are things by you? If you’re still up for that guest post, you’re more than welcome.